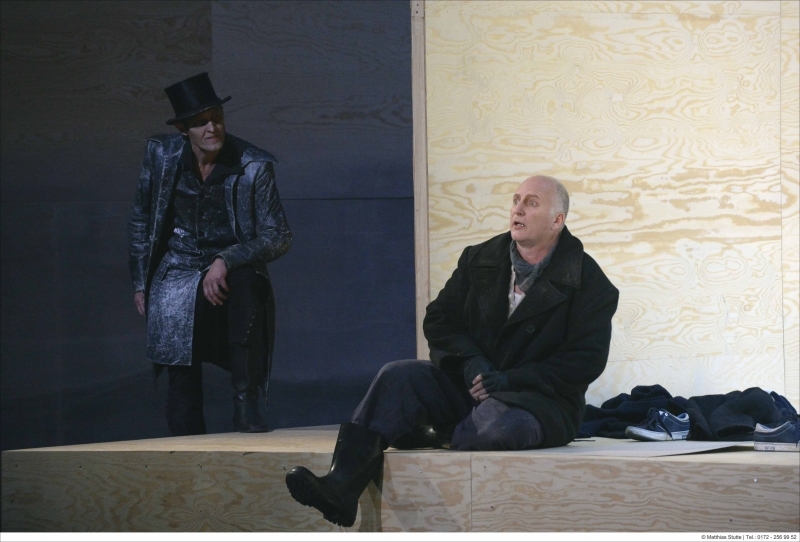 Grimes (Heiko Börner) with the sinister Dr Crabbe (Tobias Forstreuter) looking on. This, my third German Grimes of 2015 (see also here), was the first of them to be given the full Regietheater treatment. The previous two productions had displayed various degrees of naturalism, extending in Ulm’s case as far as Expressionism. Roman Hovenbitzer’s production for the twinned Krefeld/Mönchengladbach theatres extends to surrealism. He has latched on to the British seaside tradition of the Punch and Judy show and used it to cast light on the violence at the heart of the opera. The silent Dr Crabbe is the puppet-master, following and guiding the action, prodding characters into action and forcing Punch’s red cap on to them. The dock in which Grimes faces the coroner in the Prologue is also the puppet booth, and the puppet dolls are occasionally donned to mimic the actions of the people, the baby coming to represent the dead apprentices, whose shrouded, lifeless bodies both come to haunt Grimes in his final mad scene. Roy Spahn’s set is like the inside of a plywood box (an analogy to the puppet theatre again, made of the same material) with sides that open up to allow the towns-people to view the court from the outside and which provide a blank canvas for some highly evocative aqueous video projections. The Borough is represented by a model village and the Boar is little more than a rowdy gathering. Hovenbitzer portrays a society where casual violence is the norm: Mrs Sedley trips Ellen up as she is called to the court in the Prologue; knives are drawn in the pub – the idea being, presumably, that Grimes’s brutality (for which he exhibits remorse in the hut scene) is drawn from the environment in which he lives. 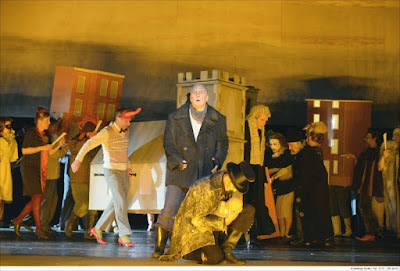 The surrealism comes in with the populace’s fancy dress for the dance scene in Act III, highlighting the commedia dell’arte roots of the puppetry and which gives a gawdy, lurid hue to the posse that hounds Grimes to his death, waving their slapstick weapons like Punch. It also colours the characterisation of the townsfolk, with a certain amount of caricature of the ‘quaint Englishness’ that make this and Albert Herring favourites with German audiences. In a more naturalistic setting one could quibble about the clerical costuming of vicar and methodist preacher, though I liked the idea of Auntie as an escapee from behind the bar at Coronation Street’s Rover’s Return. The production opened in Mönchengladbach in May and has been running in Krefeld through the autumn, with a few cast tweaks along the way. 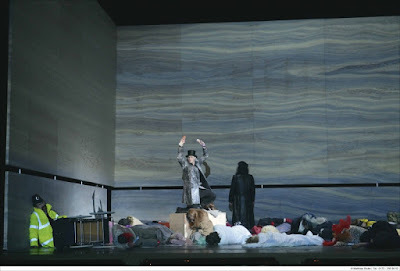 This final performance had the staging’s original Grimes in Heiko Börner, a singer who looked the part and was a compelling actor but who didn’t sound wholly comfortable with the language or the tessitura [he proved much more at home in Zemlinsky Heldentenor territory a few days later – see here]. Anna Preuß’s Ellen was a treat, with beautifully nuanced singing and strength of tone, though Johannes Beck’s Balstrode felt a little distant dramatically, though this may have been the fault of the direction rather than the singer, an imposing figure himself. Eva Maria Günschmann, who I have previously admired in the trouser roles of Octavian and Adriano (Rienzi) at this house, was as impressive as ever as a blowsy Auntie and Gundula Schneider, although looking formidable in her tweeds, for once under-played the more caricatured temptations of the role of Borough busybody, to good effect. James Park’s detailed Bob Boles, Andrew Nolan’s eloquent Swallow and Rafael Bruck’s fluent Ned Keene were all notable interpretations. 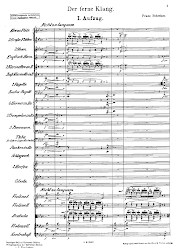 The chorus didn’t have the power of Koblenz’s in the summer, but made a decent impression, and the Lower Rhine Symphony under Alexander Steinitz brought their months of familiarity with the score to bear in a performance with bite and plenty of atmosphere.